Based on the biographical account of Ron Stallworth, BlacKkKlansman is one of those times that truth is certainly stranger than fiction. It documents an operation taking place in 1979 where Stallworth managed to infiltrate the Ku Klux Klan. For nine months Stallworth worked to become a member of the “invisible empire”, even contacting former Grand Wizard of the KKK David Duke (played with exceptional relish by Topher Grace) himself, this was despite the fact that Ron was Colorado Springs’ first black police officer. 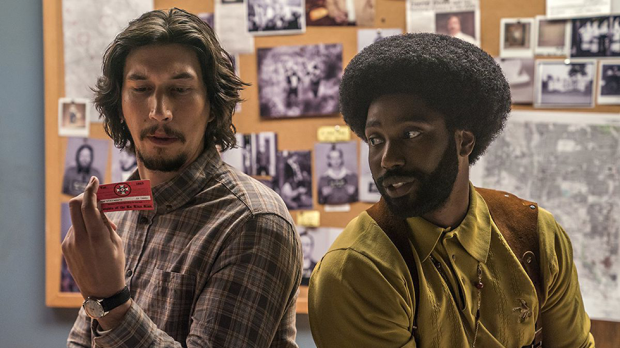 BlacKkKlansman is a vastly ambitious piece, that at face value shouldn’t work. In fact under most directors it wouldn’t, at least not to the extent that happens here. Not satisfied just in telling the story, which in and of itself is gonzo enough, Spike Lee uses it as a launching point for a discussion about the racial politics in America, the cultural history of Black portrayal by Hollywood, and a blatant dig at the rise of the radical right and the current state of politics in America. Lee leaves no doubt as to what his intent is here, drawing a complete through line to the Charlottesville rallies and the Trump administration’s acceptance (and reliance on the support of) such factions. These interrelated, yet vastly different agendas clash up against each other, and although they are not executed seamlessly by Lee, at least appear effortless. The result is phenomenal: an enormously entertaining movie that is littered with a rich text of cultural, filmic, and political references. These are not merely dropped into the film from the dialogue, but woven throughout the fabric of the film, in the various styles of cinematography Lee uses to create his sequences. It could be overwhelming, yet the actors imbue this with a great sense of comedic timing. It feels genuine and effecting, but never born down by it’s weighty subject matter. John David Washington is perfect as Stallworth, brining a lightness of touch to the role, a balance of social responsibility and a certain impish nature. Adam Driver brings a wondrously laid back sense of sense of comic timing to Detective Flip Zimmerman, the “face” part of Stallworth’s undercover operation, as Zimmerman (Stallworth’s contact with the Klan is purely phone based, while Zimmerman plays him in any face to face meeting). The role also allows Driver to stretch his acting muscles as the course of the investigation leads him to recognise and examine what his own heritage means, and the scenes where Washington and Driver play off each other through these self reflections are beautiful moments of dramatic revelation. BlacKkKlansman is a densely layered work that functions on a number of levels, from entertainment to political clarion call. It is also a timely reminder as we have seen this week (both domestically and abroad), that sometimes the past is not as distant as we (might hope to) imagine.